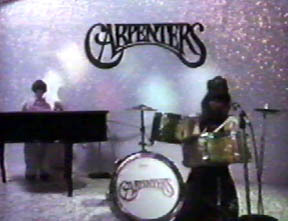 Last night we (finally) saw Todd Haynes’ Superstar: The Karen Carpenter Story last night. After years of being snubbed by the clerks at Kim’s Video when I’d ask for it, and half-hearted attempts to get a bootleg copy from someone or other, we just walked over to Anthology and there it was, showing as part of Illegal Art!. Other films screened with Superstar, all using unauthorized/illegal footage or music in some way. For my money, the best ones were not about appropriation per se; Michal Levy’s Giant Steps, for example, is a fun, beautiful CG interpretation of John Coltrane’s canonical (and surely impossible to clear) recording. A slightly unrelated note: Apparently, my new haircut is something of a proto-mullet, not unlike Todd Haynes’.